Mass rename and relink asset files. There is a free nice old script wich unfortunately is not working on max 2018 windows 10, but it has been very very useful in past for those that create volumes and collections. It is called Interactive Universal Renamer from CBuelter de. You can take it for refference. I tried to rename asset files one by one with PM/Asset Files/Set Path (with the box checker “Rename Files on Hard Drive”) but even Project Manager (v2.80.76) did not rename files on hard drive. Link must have a status #OK.
Next version will be support to assets with status #Found. Mass rename and relink asset files. 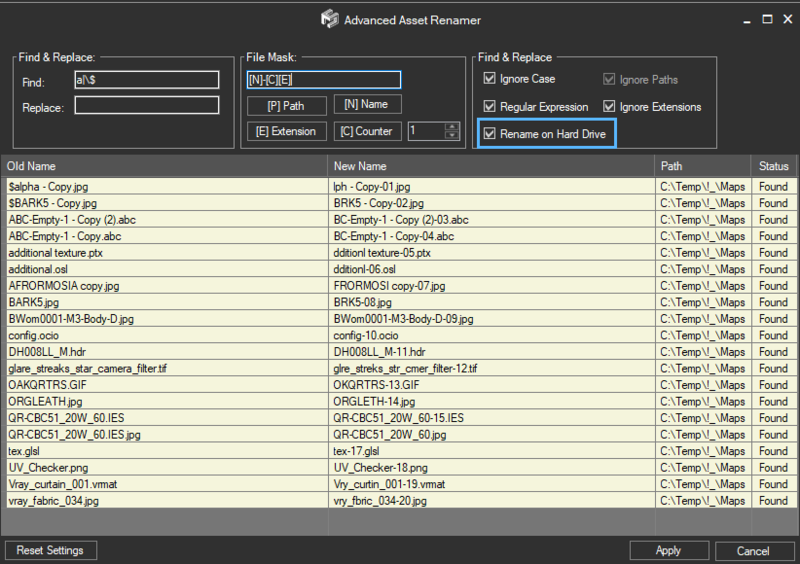 Please if not asking too much, add as option along “asset file name” also “max file name”, it is very usefull when having many textures from multiple max files into one single folder. Thanks a lot for developing such a great and complex script!